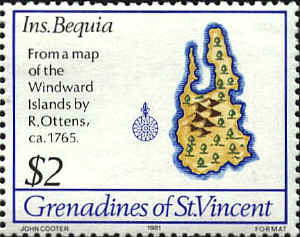 In 1616 a survey of the island of Bermuda was initiated by Captain Daniel Tucker, the appointed governor and one of it "adventurers." Richard Norwood was commissioned to make the survey "assigning to every adventurer his share or proportion." Norwood's map was engraved by Abraham Goos of Amersterdam and dated 1626. It was first published in John Speed's A Prospect of the Most Famous Parts of the World, London 1627. It later appeared in Willem Janszoon Blaeu's Atlantis Appendix, Amsterdam, 1630, and Henricus Hondius, Atlas ou Representation du Monde Universel, Amsterdam, 1633. 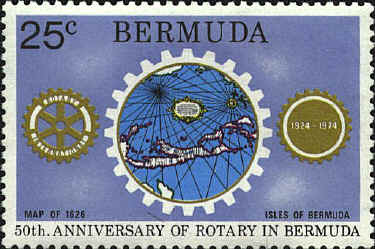 The stamp is adapted from the Hondius version. 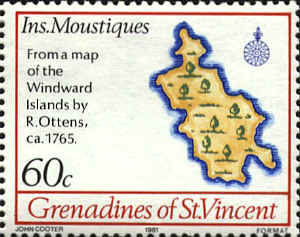 Joachim Ottens (1663-1719) founded a map publishing firm in Amsterdam. His sons Reiner and Joshua continued the business after their father's death. They produced enormous collections of maps, some as large as 15 volumes, made up to order and were magnificently colored. They also issued single-volume atlases with varying contents as well as pocket atlases. 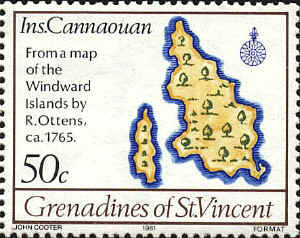 The maps of islands in the Grenadines were published around 1765.